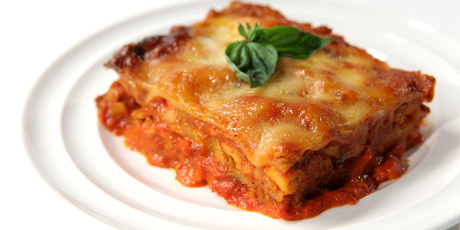 Rick Matharu's butter chicken lasagna combines the best of Indian and Italian cuisines in one amazing dish! You might also like these Lasagna Recipes to Keep You Cozy. 1. For tandoori marinade: In large bowl, whisk together yogurt, lemon juice, tandoori spice blend, fenugreek, salt, pepper and hot pepper flakes until well combined. Add chicken; toss to coat. Cover with plastic wrap; refrigerate 8 to 12 hours. 2. Preheat oven to 400ºF (200ºC). Scrape marinated chicken onto rimmed baking sheet lined with parchment paper. Bake in centre of oven for about 25 minutes or until cooked through. Remove from oven; let stand 15 minutes. Cut chicken into ¼-inch (5 mm) cubes. Place in bowl, cover with plastic wrap and place in refrigerator. 1. For butter chicken sauce: In medium saucepan, heat olive oil and butter over medium-high heat. Add cumin seeds; toast, stirring frequently, for 2 minutes. Add onion, garlic and turmeric; cook, stirring frequently, for about 5 minutes or until onions are softened. Add ginger, tandoori spice blend and hot pepper flakes; cook, stirring, for another 2 minutes. Stir in 1 cup (250 ml) water, tomatoes, cream, fenugreek and sugar. Bring to a gentle simmer, stirring occasionally. Cook for 20 minutes. Add cooked chicken cubes; simmer for another 15 minutes or until sauce is thickened. Set aside. 1. Meanwhile, make vegetables: In medium saucepan, heat olive oil and butter over medium-high heat. Add onion and garlic; cook, stirring frequently, for about 5 minutes or until onions are softened. Add mushrooms and green peppers; cook, stirring, for 8 to 10 minutes or until vegetables are soft. Add salt, garam masala and pepper; cook for another 2 minutes. Set aside. 1. Assemble lasagna: Preheat oven to 400°F (200ºC). Spread one-third of butter chicken sauce over bottom of 13 x 9-inch (3 L) glass baking dish. Arrange 5 noodles over top. Dollop with ricotta; top with Vegetables. Arrange 5 more noodles over top. Spread another one-third sauce all over. Sprinkle with half of mozzarella. Top with remaining noodles. Spread remaining sauce all over. Sprinkle with remaining mozzarella. Cover loosely with foil. 2. Bake in centre of oven for 45 minutes; remove foil. Sprinkle with basil. Return to oven for another 5 minutes or until bubbling and golden on top. Let stand 10 minutes before serving. Note: "Cooking time" includes cook time for butter chicken sauce, tandoori marinade and vegetables as well as the bake time for the completed lasagna. ***This original recipe was tested and modified to make it suitable for use in a home kitchen.